STEVE CUNNINGHAM: "I DON'T BELIEVE HE THINKS HE CAN WIN...I'D BE COOL WITH TARVER GETTING THE BRUNT OF THE PURSE"
"They are scheduling me October 1st in Germany with an opponent to be announced, but I've been trying to lock in Tarver. He's claiming he's the best crusierweight in the world after beating Danny Green for the IBO title. I've been going back and forth with him on Twitter and he's not interested. I don't believes he thinks he can win against me and he wants to get paid...I'm still baffled why crusierweights don't generate money. Everyone saw the fight I had with Adamek and it was a great fight. With Tarver, we've got the credibility of a future hall-of-famer and a good talker, and I don't know why the money isn't there. I would take a pay cut to do the fight with Tarver, and I'd be cool with Tarver getting the brunt of the purse. I'm that confident in winning and after that, I'd look for mine. That's the way it goes for guys like me. I can sacrifice a little to gain a lot later," stated IBF cruiserweight champion Steve Cunningham, who's more than willing to face Antonio Tarver for short money for the opportunity to prove his greatness. Check out what he had to say about his future plans and much more. DK: How's it going Champ? SC: Going pretty good. They are scheduling me October 1st in Germany with an opponent to be announced, but I've been trying to lock in Tarver. He's claiming he's the best crusierweight in the world after beating Danny Green for the IBO title. I've been going back and forth with him on Twitter and he's not interested. I don't believes he thinks he can win against me and he wants to get paid. DK: Tarver has talked about going overseas to fight for big money, or potentially have a big fight in his home state of Florida. Would you be willing to fight Tarver in Florida? SC: My whole thing is, I'm still baffled why crusierweights don't generate money. Everyone saw the fight I had with Adamek and it was a great fight. With Tarver, we've got the credibility of a future hall-of-famer and a good talker, and I don't know why the money isn't there. I would take a pay cut to do the fight with Tarver, and I'd be cool with Tarver getting the brunt of the purse. I'm that confident in winning and after that, I'd look for mine. That's the way it goes for guys like me. I can sacrifice a little to gain a lot later. 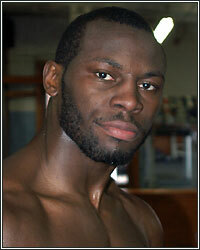 DK: After the Mares-Agbeko fight, Gus Johnson and Al Bernstein asked Tarver what he wanted to do next. He mentioned a few names at cruiserweight, including a man you have beaten in Marco Huck, and then said his ultimate goal is to become heavyweight champion. You're the recognized number one guy at cruiserweight. Why do you think he didn't mention your name for a potential showdown? SC: This is the thing, when you have a guy who is the best cruiserweight in the world and been at the top for years, when you have guys like Tarver claiming he's the best and he skips over the recognized number one guy, what does that say about him? If you claim to be the best, you have to beat the best. Where is Steve Cunningham? I'm old school. You gotta beat the best. When David Haye was at cruiserweight and beat Enzo Maccarinelli, he claimed he cleaned out the divsion. The guys on Showtime should have said, "Hold up, there's still Steve Cunningham." Nobody says Steve Cunningham is at the top of the list. Maybe behind the scenes they said, "Don't mention Cunningham." I've beat all the champs, beat the top 10 guys, and these guys don't mention me. I understand because these guys are smart, and they're smart because America has only seen the best crusierweight in the world once. They've only seen me once. It's like a game. DK: Why do you think the networks treat you like that? SC: I think part of it had to do with the fact I was promoted by Don King for 8 years. The networks don't want to deal with him, but I thought if I kept winnig, eventually they would give me a shot. The networks can skip right over you and that's the reality. But even before I signed with Sauerland...and my fan base is huge overseas. I'm getting recognition, just not in my home country. There should be some money thrown for a Tarver-Cunningham fight. Marco Huck is beating guys he should be sparring with, except Lebedev, who I thought beat Huck. I'm trying to get unifiactions bouts. My resume makes it hard for me to get unifications because nobody wants to get in the ring with me. DK: Have there been names thrown out for your October 1st fight? SC: The top 10 in the IBF. We've been trying to get a great, tough fight. If Tarver decides to do a fight, I'm more than willing, but it's up to Tarver to say, "I'll do it," and the networks to pay for it. It's so attractive of a fight, but the unattrctive part is putting it together. I've stopped shaking my head years ago. I'm not patting myself on the back, but it's disgusting to me what is going on. My resume speaks for itself and I'm the best crusier in the world. I've done a lot and I don't think there is another guy in the world right now who has beaten all the other titlists in the division. If the Amreican people were able to see it, I'd be a superstar right now. DK: Any final thoughts Champ? SC: I just hope the networks wake up and stop overlooking the crusierweights. The crusierweights were hot when it was O'neill Bell, Mormeck, myself, and others, and it was poppin. They just didn't stick with it. Whatever it is that causes networks to not showcase cruiserweights, we can work it out. I don't know what it is, but there are great crusierweights out there and I hope we all get our chance to showcase the division. DK: Thanks again Champ, and we look forward to checking in with you throughout training camp. SC: No problem. Talk to you soon.